This is a true Nutrition Superstore. Netrition offers up the most popular nutrition supplements as well as a wide variety of specialty products from the majority of manufacturers. Often one of the first to get new products, their shipping costs are often very low. They're efficient and their site loads quickly. You'll usually find excellent pricing too! Elaine Payne's low-carb gala of goods seems to grow every day! It's a varied and fun shopping experience and too much to describe here, so just go! And make sure you look for the featured items each week as well as regional specialties. Very reasonable prices, excellent packing, and fast shipment. 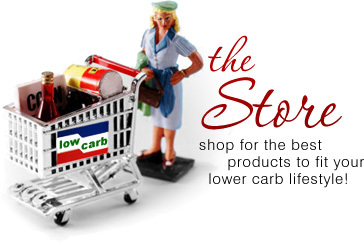 Andrew DiMino runs this large online Yahoo Store boasting all the latest low-carb products. CarbSmart strives to be a consumer's one-stop shopping source for products that represent good food as well as good nutrition. They pride themselves on customer service, and don't promote diet gimmicks. Brett Railey's store offers up a specialty storefront selling lots of low-carb food products including most major brand lines, and specializing in the highly innovative Low Carb Chef brand. Pretty much anything of value to low carbers, Brett will find a way to track down. So be sure to let them know if you have a special request! Home of the fabulous DaVinci Gourmet sugar free syrups. For years, low carbers have been enjoying their zero carb syrups in drinks, in baking, and in adding that "special touch." They're always adding new flavors to their sugar free line. Creative and delicious, you won't want to low carb without DaVinci! Expert Foods' line of high-quality thickening ingredients, dessert mixes, and cooking products maintain the texture and taste that home cooks love, while delivering the low carb counts that satisfy the dieter's lifestyle. They do all this without the use of flour, cornstarch, or processed sugars.